We’re already approaching the halfway point in the year and we’re off to a great start. The MGTA has hosted several great events in the past few months, including a partner networking event with the French American Chamber of Commerce. This highlights a focus of ours for 2015, expanding our offerings by partnering with other chambers and trade organizations within the Midwest. By partnering with these cooperating organizations, we expand our footprint and ability to offer to programming in new and diverse topics. We have several networking events coming up in the next month; I hope to see you there. Don’t forget to register for the annual MGTA golf event this August 13; we expect to see another year with great turnout. International trade compliance and customs broker company Livingston International announced the launch of its new brand positioning to reflect its expertise and continued commitment to simplify trade for its clients. The company also premiered a new website, www.livingstonintl.com, which has been completely refreshed to support its new positioning. Anticipated confirmation of several major free-trade agreements, including the Trans-Pacific Partnership, will have a tremendous impact on international trade and give Canadian and U.S. exporters better access to global markets. Livingston’s global headquarters is in Toronto. The company opened its U.S. headquarters in Chicago in 2015 to support its continued growth into the U.S. market. Earlier this year, Livingston announced the restructuring of its Global Trade Management division to ensure clients have access to the services, technology and training that will help them compete in the global market. By the end of 2015, Livingston expects to add 75 employees at its new Chicago office that will be located in the historic Chicago Board of Trade building at 141 West Jackson Boulevard. On Febuary 20, it was announced that the International Longshore and Warehouse Union (ILWU) and Pacific Maritime Association (PMA) reached tentative agreement on a new five-year labor agreement. The tentative agreement signed Feb. 20 by the ILWU and the PMA includes: wage increases (that are more generous than in previous agreements), full dockworker maintenance of benefits to be paid for by the PMA including the Cadillac health care tax under the Affordable Care Act, and a new arbitration system that replaces individual arbitrators in the local ports with a three-member panel. On April 3, ILWU Caucus delegates voted to recommend approval of the tentative five-year contract agreement reached in February. The next step to full ratification of the labor contract is a secret ballot membership ratification vote, to be conducted on May 22, which will be the final step in the approval process. Until this ratification vote by the ILWU rank and file takes place, the industry remains at risk to labor disruptions throughout the West Coast ports. As of April 21, 13 vessels remain at anchor in LAX/LGB alone and 20 vessels were at berth. It is a continuous struggle for the terminals to get ahead of the backlog with new vessels arriving weekly. On average, drayage drivers are spending 1.5 to 2.5 hours per container transaction; this is down from a few weeks earlier when it was 2 to 3 hours. Historically, turn times were around 1.0 to 1.5 hours prior to the port congestion. Chassis supplies remain tight but we have not experienced terminals running out of chassis with the occasional exception of 20’ and 45’ chassis. The union labor pool appears tight despite the tentative contract agreement. The ILWU is cooperating on labor requests but they simply don’t have enough skilled labor to fulfill the terminal requests. In the last 15 years, Global Trade Compliance has developed into a full-fledged career field due to the growth in international business, import-export, and supply chain. However, most people are unfamiliar what trade compliance is, what it involves, and how one can begin a career in this expanding career field. Companies which are active in international business and depend on their products moving across geographic borders often employ a trade compliance team, consisting of one to several dozen employees, with varying trade compliance expertise. Trade compliance is concerned with moving shipments in and out of countries and complying with rules and regulations of the sending and receiving countries. In the United States, companies must be in compliance with the US Customs and Border Protection (CBP), the Office of Foreign Asset Control (OFAC), and the Bureau of Industry and Security (BIS). Additionally, health care companies, especially medical device companies, must deal with the US Food and Drug Administration (FDA). Companies doing business in other countries are subject to those rules and laws, accordingly. Global trade compliance departments are generally staffed with positions of expertise. For example, teams often consist of export or import specialists; regional experts, such as the Asia-Pacific (APAC) or EMEA (Europe, the Middle East and Africa); specific skill sets such as a licensed customs broker or knowledge covering hazardous waste, licensing, country of origin, the Food and Drug Administration (FDA), and the North American Free Trade Agreement (NAFTA). The company’s products, industry, the country or countries it does business with, and its particular needs, will often dictate the make-up of the trade compliance department. Most trade professionals begin their careers by stumbling into the industry. Often one is employed in transportation, supply chain, or procurement, fills a trade compliance need on-the-job and builds his/her expertise from there. Continuing education is an integral part of a trade professional’s success, where subject matter expertise must be constantly updated and applied. Topics include: country of origin, export controls, classifying products, licensing, making customs entries, free trade agreements, Customs Trade Partnership Against Terrorism (C-TPAT), Export Classification Control Number (ECCN), and the Export Administration Regulation (EAR), etc. Local community colleges, trade associations such as the Midwest Global Trade Association (MGTA), state and federal trade organizations, as well as national, private and not-for-profit organizations offer trade compliance and import-expert-related seminars and classes. Global Trade Compliance is an exciting and growing career field. As technology continues to facilitate global business’ expansion, this field will not only be in demand, but also require those with the appropriate skill set, knowledge, and trade compliance expertise to sustain its inevitable proliferation. INVESTMENT: Africa is in need of $93 billion in infrastructure investments each year. Over the past two decades, African countries’ infrastructure investments have been increasing exponentially. These investments have been boosted by the volume of intra-regional trade as well as by foreign direct investment.To better understand the critical role of infrastructure in the coming decades in Africa, it is important to consider the population projection made by the United Nations' Human Development Index, which shows that the African population will double to 2.4 billion by 2050. This dramatic increase in population will have a substantial impact on Africa’s existing infrastructures. To better tackle this situation, African countries are beginning to put policies into place in order to adapt to the new dynamic: Sub-Saharan Africa’s projected economic growth is expected to reach 4.9% this year, which is double the projection for advanced economies; North and Southern Africa’s growth acceleration is expected to go from 1.6% and 2.9 % in 2014 to 3.9% and 3.6% respectively in 2015; Central and West Africa on the other hand are expected to experience moderate growth, from 4.3% and 5.9% in 2014 to 4.7% and 6.2% respectively in 2015. These numbers demonstrate that the need for significant improvements in infrastructures is a reality. Global players such as the US and China are seizing this huge opportunity. But US involvement in this sector of investment is overshadowed by China. 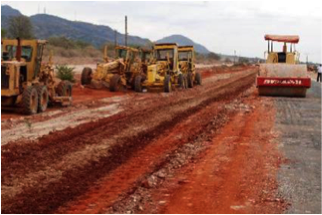 Chinese companies keep pouring their investments in road and railroad construction projects across Africa. Angola, for instance, has spent $1.83 billion in mostly oil-backed loans from China to rebuild and restart its railway system as it works to recover from a 27-year civil war that ended in 2002. Also, China’s dream of a trans-Africa railway that would build tracks for a shorter and faster version of the Cape-to-Cairo rail line is taking shape. Despite the investments of US, Chinese and European firms on Africa’s infrastructures, a gap still remains. It has been estimated that African countries need to spend $93 billion a year on infrastructure improvements, more than double what the Infrastructures Commission of African Development Bank estimated in 2005. This shows that there is room for all investors in Africa when it comes to infrastructure investments. By Jakub Kowalczyk, Branch Manager of the Eagan, MN-based office of Purolator, Inc., and a member of the MGTA’s Communications Committee. You may have noticed that you are paying less at the pump today than you were a year ago. While low oil prices (which have dropped as much as 50% over the last year) are a relief to consumers, what could be the impact long term for the economy in the Midwest and globally, and is it all positive? If we examine the cost of Brent Crude over the past 52 weeks, the high in June was $109 with the low in January around $50 per barrel. Crude Oil faced the same pressures with a 52-week high of $98 and 52-week low of $45 coming in a similar time. These high prices have spurred oil companies in the US (particularly in North Dakota and Alberta) to invest in fracking and horizontal drilling. They also are one of the main economic (if not the main) drivers in countries like Russia, Iran, Venezuela, and Saudi Arabia. What happens now that prices have fallen and most economists and oil companies predict prices remaining mostly flat for the next year? Midwest (US and Canada): It is difficult to determine a “breakeven price” in the US and Canada, but Scotiabank has estimated the breakeven for shale and oil sand project ranging from $48 to $68 with a weighted average of $60 to $61. Areas with a high upfront cost and areas where companies have large sunk costs will remain drilling and could remain drilling for years or decades. Fracking wells, on the other hand, tend to dry up quickly; when prices are below $60, companies are more hesitant to drill new wells. In the US, the number of rigs has fallen 15% from December to January. Overall, oil producing states and provinces will likely see drops in revenues and economic activities. In the US, lower oil prices are seen as a positive in 42 out of 50 states. In Canada, lower oil prices and their effect on economic growth “will be muted,” while consumer spending will benefit, as will “energy-consuming” sectors, such as transportation. Global Impact: Counties like Russia, Iran, Venezuela, and Saudi Arabia all have been impacted by falling prices. In Russia, 45% of the government budget depends on oil production. The fall has caused a collapse in the ruble, GDP has shrunk an estimated 4.5% and interest rates have risen from 10% to 17%. In Iran, prices of oil need to be north of around $100/barrel to balance its budget — and sanctions have made it harder to export oil. After years of recession, the country was poised to grow 2.3%, which is now in jeopardy as oil prices fall. Venezuela has seen its economy shrink 3% and inflation is high. Saudi Arabia is expected to run a deficit equal to 14% of GDP. Overall in diverse economies like the US and Canada, the effect could be muted and offset by an increase in consumer spending. This said, countries with economies heavily dependent on oil may have to make tough decisions on spending, interest rates, and government policies to prevent panic from setting in. Source: Global FX Strategy 2015, John Normand, published November 25, 2014. The dollar is ending 2014 higher than almost every currency, a sweep that rarely occurs outside of recessions or financial crises. Here's what else the foreign exchange has in store for the market. Strong fundamentals pushed the US dollar up against every major world currency in 2014. The dollar is forecast to continue its rise in 2015, but a number of unresolved questions will impact foreign exchange markets over the coming year. Strong Fundamentals at Home: The US economy has experienced a more robust recovery than Japan or the Eurozone, and domestic growth is forecast to continue leading the developed world through 2015. The economy’s underlying strength will naturally push the value of the dollar higher, especially if a tightening labor market allows the Federal Reserve to raise interest rates, as planned. Quantitative Easing Abroad: The actions of foreign central banks are likely to further boost the dollar in 2015. Intending to stimulate growth and spur inflation, the Bank of Japan has committed to a quantitative easing (QE) program. The program will also put downward pressure on the value of the Yen. The European Central Bank’s new head, Mario Draghi, seems eager to bring quantitative easing to Europe, and he may succeed in 2015, if Eurozone growth remains weak. Decelerating Developing Markets: The conditions causing below-trend growth in much of the developing world will likely persist in 2015. Despite expanding at a much faster rate than developed economies, China’s 7 percent growth in 2014 fell short of its potential. Slow Chinese demand sent ripples throughout East Asia, and major commodities exporters, such as Australia and Brazil, saw their currencies slide due to weaker demand for raw materials. The Bond Conundrum: The yield on 10-year Treasury Bills fell in 2014, even as 2-year yields rose. Although some fear that this conundrum is the result of diminished expectations for the nation’s long-term growth, the divergence is more likely the product of temporary market circumstances, such as uncertainty over the near-term impact of asset-purchasing programs abroad. The theory of “secular stagnation” proposes that structural changes have diminished the US economy’s ability to grow. Secular stagnation explained the slow recovery of the labor market by suggesting millions of long-term unemployed workers had become “unemployable” and would permanently drop out of the workforce. The exit of millions of “unemployable” workers from the labor force would significantly damage the nation’s potential to grow over the long run. Fortunately, 2014 brought stronger job creation, and the long-term unemployment rate has fallen by half as discouraged workers return to the workforce. While the bond conundrum is certainly unusual, it is hardly proof of secular stagnation. Market Overconfidence: Markets are certain the dollar will continue to rise in 2015, but investors could be disappointed if domestic growth falters. Current valuation reflects high confidence that the Federal Reserve will raise interest rates on schedule, but a slow start to 2015 could delay the hike and upset expectations. Falling Liquidity: Reserves of liquidity—the supply of foreign currency kept on hand by banks—generally fluctuate in tandem with international trade volume. In recent years, this connection has broken down, with trade volumes rising far faster than liquidity. Although current reserves are not abnormally low, the market has not been tested by a major shock since 2008, and a global financial disruption could stress liquidity in unanticipated ways. A Tightening US Labor Market: If falling unemployment causes wages to rise, the Fed is certain to raise interest rates on schedule, boosting the dollar’s value. Consistent growth and a strong dollar would make the US a more attractive destination for foreign direct investment; 2015 could bring an influx of foreign capital, reminiscent of the late 1990s boom. The Impact of Easing Abroad: The Bank of Japan is committed to a major asset-purchasing program. If Japan succeeds in meeting its inflation target of 2 percent, big changes are in store for bond markets. The European Central Bank has yet to agree to a QE program, but the odds are even that some version of QE will emerge in Europe in 2015, a development that could profoundly impact the Euro’s valuation. Can OPEC End Cheap Oil? A sustained slump in oil prices pushed down currency values for oil-exporting nations in 2014, but an OPEC supply cut should prop up prices next year. In 2014, oil supplies expanded, even as weak demand sent prices falling below $60 per barrel. Exporters’ currencies shed value as global oil revenues declined an estimated $1 trillion USD. OPEC is expected to reduce global supply by 1.3 million barrels daily in 2015, which should send prices back towards $90 per barrel by year's end. But nothing is certain. The North American oil boom has weakened OPEC’s global dominance. The cartel’s prolonged inaction in the face of falling prices has already surprised many, and developments in the oil market can be tough to predict. Does a Strong Dollar Hurt US Exporters? Asset purchasing has arrived in the Eurozone and Japan, pushing up the price of the dollar against foreign currencies. 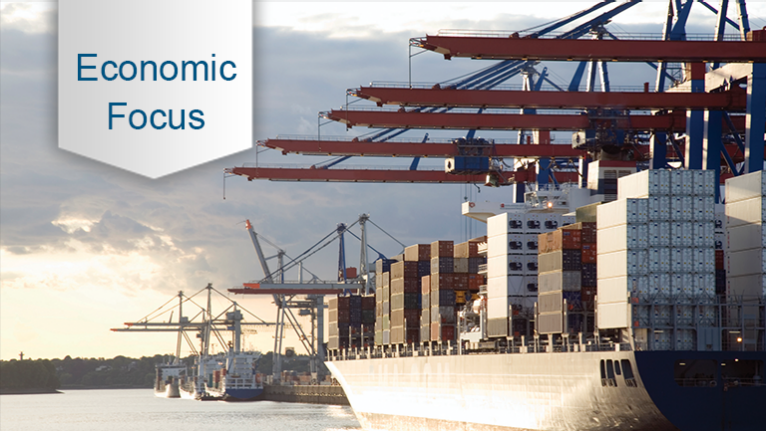 US exporters may experience some short-term pains, but what about the long-term forecast? 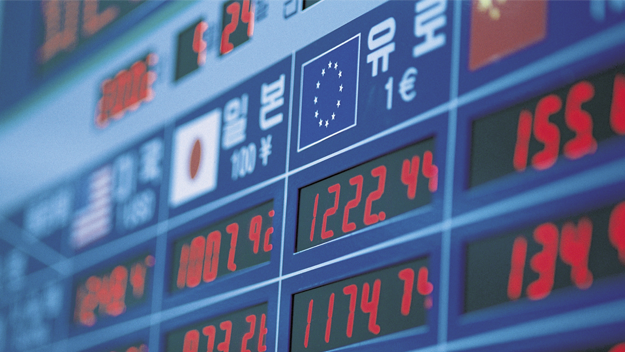 Throughout 2014, the US dollar made strong gains against the Euro and Yen, causing pain for the nation’s exporters. Since American manufacturers purchase raw materials and pay their workers in dollars, an increase in the dollar’s value effectively drives up the relative operating expenses of American companies, making their goods more expensive overseas. Since June, the dollar has risen 20 percent against the Japanese Yen and 10 percent against the Euro, putting a strain on the competitiveness of American goods in foreign markets. The rising currency’s impact on trading volume is already clear—despite the steadily improving domestic economy, America’s exports have stagnated in recent years. And though trading volume has grown at a far slower pace than its pre-recession trajectory, the damage should prove temporary. Although the dollar’s recent strength has undoubtedly hurt exporters, the forces driving the currency’s rise are welcome developments in the global economy. Most of the dollar’s rise has been a reaction to monetary easing abroad. Just as the Federal Reserve tapered its asset purchasing program at home, Japan undertook an aggressive round of quantitative easing, and the European Central Bank unveiled its Eurozone bond-purchasing program. These policies are intended to spur inflation and stimulate growth in the languishing European and Japanese economies, but they have also impacted foreign exchange rates. Quantitative easing abroad has had a more positive effect on bond markets. These programs are designed to drive down yields on Eurozone and Japanese bonds, and investors have responded by shifting toward US bonds, pushing yields lower at home, as well. Currently, 10-year Treasury yields are at 1.64 percent, matching the artificially low rate achieved during the Fed’s recently discontinued asset purchasing program. European and Japanese monetary policies may have proven disruptive for American exporters, but the broader US economy will benefit from historically low interest rates, which will lower the cost of borrowing for government, businesses and households alike. Ultimately, America’s exporters have a strong interest in the health of the European and Japanese economies. Eventually, the damage from the strengthening dollar should be more than offset by rising demand abroad, which would be the end result of stimulative foreign monetary policies. The growing importance of trading partners in the developing world has also offset some losses for exporters. The dollar’s value has held steady against the currencies of developing economies, including the Chinese renminbi and Indian rupee, which are rapidly growing markets for American goods. In the current global context, the dollar’s rise is likely a cause for concern, but not alarm. This article was compiled using information from BBC World as well as from Wikipedia. Since the fall of the US-backed dictatorship of Fulgencio Batista in 1959, Cuba has been a one-party state led by Castro and — since February 2008 — by his chosen successor and younger brother, Raul. Castro exercised control over virtually all aspects of Cuban life through the Communist Party and its affiliated mass organisations, the government bureaucracy, and the state security apparatus. Exploiting the Cold War, Castro was for decades able to rely on strong Soviet backing, including annual subsidies worth $4 to $5 billion, and succeed in building reputable health and education systems. But, at least partly because of the US trade sanctions, he failed to diversify the economy. The disappearance of Soviet aid following the collapse of the USSR forced the government to introduce tight rationing of energy, food, and consumer goods. The economy soldiered on with the help of Canadian, European, and Latin American investments, especially in tourism. Controls were relaxed in the 1990s, with companies allowed to import and export without seeking permission and a number of free trade zones opening up. However, after Castro was succeeded as president by his brother Raul, the pace of economic reform picked up once more. Some of these economic reforms were later rolled back, with Fidel Castro denouncing what he called the "new rich." But the money sent home by Cubans living abroad — many of them in the US city of Miami — is still crucial to the economy. Hardships have led to an increase in prostitution, corruption, black marketeering, and desperate efforts to escape in search of a better life. The US leases the Guantanamo Naval Base on the eastern tip of the island under a 1903 treaty, and continues to send Cuba payment for it. Cuba under the Castros disputes the lease, saying that it was concluded under duress, and has refused to cash any of the checks since the early days of the revolution. Relations with the US showed signs of a thaw following the election of President Barack Obama. In December 2014, Obama said, the "US and Cuba would end more than 50 years of hostility and were talking about restoring diplomatic ties." He said, "the policy of isolating Cuba had failed." President Castro said, "the island would not give up its socialist principles." Russia has also taken steps to revitalize ties with its Soviet-era ally, and has signed agreements to explore Cuba's offshore oil deposits. On December 17, 2014, US President Barack Obama and Cuban President Raúl Castro announced the beginning of a process of normalizing relations between Cuba and the US, which media sources have named the "Cuban Thaw." Negotiated in secret in Canada and Vatican City, and with the assistance of Pope Francis, the agreement would see the lifting of some US travel restrictions, fewer restrictions on remittances, US banks access to the Cuban financial system, and the establishment of a US embassy in Havana, which closed after Cuba became closely allied with the USSR in 1961. Also in 2014, Cuba won international praise for its response to the Ebola epidemic in West Africa, after Havana sent hundreds of front-line medical staff to help deal with the crisis.